If you are searching for “auto ac repair“, “ac recharge service“, “car air conditioner repair near me“, “car ac compressor repair“, “car ac repair“, “car a/c service near me” or “truck ac repair” in Scottsdale, Bridwell Automotive Center can help! Our team of ASE Master Technicians will find your what’s wrong, give you an auto ac repair estimate, and fix whatever is preventing your auto AC system from working. Diagnostics costs are credited toward any AC repair services performed. Call 480-948-4781 to schedule your auto AC repair. 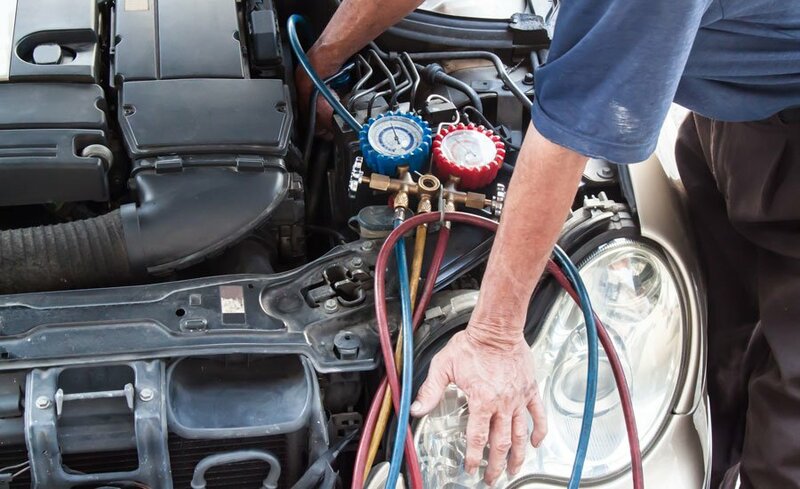 We offer auto ac recharge services for vehicles that are low on refrigerant or Freon. Our Freon recharge services includes removing old Freon and recharging your auto a/c system with new Freon. Adding in new Freon usually will make your car a/c start blowing cold again. However, if your system has leaks, a broken ac compressor or other car ac problems, no amount of Freon will make your ac blow cold again. When your ac stops blowing cold or won’t blow cold again after a ac recharge, it’s time for auto ac repair. Contact Bridwell Automotive Center to get your Freon recharged today! Don’t bother to pre-cool. Air-conditioning works far better when a vehicle is in motion than when it’s still, because “the faster the engine turns, the faster the air compressor runs.” So jump in, start driving, crank up the fans, and open just the rear windows for 10-20 seconds. There’s no better way to vent out hot air. Dial it down. If you select any temperature above the AC’s coldest setting, the system has to warm air that it has already cooled. If you’re chilly, just lower the fan speed. Turn off stop/start. The automatic stop/start systems common in new cars save fuel, but they shut down both the engine and air compressor at stops, causing the cabin to heat up quickly. Cost of the Air Conditioning System Evaluation will be credited towards your air conditioning repair service. Check our Facebook page for specials and coupons! While different brands of cars have unique problems, there are some issues that happen with all AC systems. Auto AC problems include: low refrigerant pressure, failing compressor, or electrical problem. A failing compressor is a serious problem to watch out for. If a compressor fails it can fail catastrophically and shed pieces through the hoses, condenser, evaporator, and accumulator. This buildup of debris in the system if not caught will kill a new compressor. Common signs that you’ve got a failing AC compressor is a squalling sound when you turn it on or ticking noises. Read more about AC compressor repair. Over time Auto AC systems stop blowing as cold even on the coldest setting. This is frequently caused by low refrigerant pressure. Loose or leaking hoses in your AC system can lead to low refrigerant pressure. If this happens your AC will gradually get less effective and leave you with a car that’s not ready for summer driving in Arizona. Whether the hoses or lines are simply old or have been damaged they will lead to problems. The number one problem is a loss of your AC refrigerant. We can carefully examine your AC system to find the leaks, fix them, and replace the refrigerant you’ve lost. This will restore your vehicle’s ability to blow cold air when you need it. Another part of modern vehicle AC system problems is electrical issues. The wires running between elements, the fuses, and the control system are all susceptible to wearing out or being damaged. If you’ve got a bad relay, fuse, or short in your electrical system the AC system may not work well, or not work at all. Is the Freon or refrigerant is low, your ac will not blow cold. Simply recharging the ac system with new Freon should get your car ac system blowing cold again. If you put new Freon in your vehicle’s a/c system and it still isn’t blowing cold, you might have a refrigerant leak in your ac lines. If your clutch cycling switch is having problems, it will prevent the electromagnetic clutch inside the compressor from kicking in. This prevents refrigerant from being pressurized and the system will not work. . If your condenser is blocked up by debris or is badly damaged, your car’s ac won’t get cool or cold. Kinks or restrictions in ac lines can prevent your ac from blowing cold. Simply replacing these lines can get your system working perfectly again. There are many things that can go wrong with ac compressors including, broken or faulty capacitors, start relays, valves and terminal connections. *Disclaimer – The prices listed below are general costs. This is not an actual quote for your repair. How Much Does Car AC Repair Cost In Scottsdale? Read more about how much car ac repair costs. According Auto Service Costs, the average cost to recharge a car ac system is around $235. The lowest average cost you can expect to pay is around $183 and the highest average cost is around $281. How Much Does Car AC Compressor Repair or Replacement Cost? The average cost of a new ac compressor is about $200-$600. Labor cost to install the ac compressor is about $300-$500. Total cost to install a new car ac compressor (including labor) is about $500-$1,100. How Much Does Car AC Hose Repair Cost? The average cost of ac hose repair and replacement is about $200-$500 depending on the type of vehicle you have. How Much Does Car AC Compressor Clutch Replacement Cost? The average cost of car ac clutch cycling switch replacement is about $200-$750. Our dedicated team of ASE Master Technicians will help you by finding and fixing your auto AC problem quickly and affordably. 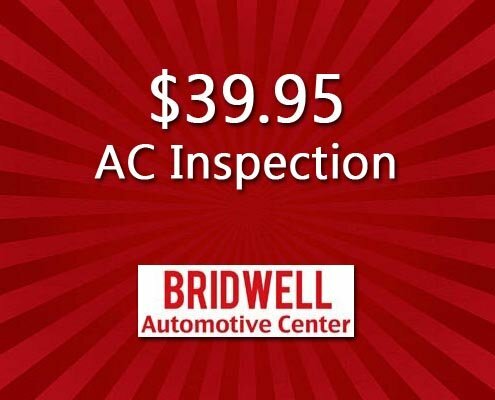 You can schedule your auto AC repair with Bridwell Automotive Center in Scottsdale by using our contact form, stopping by, or giving us a call. We can be reached by telephone at (480) 948-4781. If you are searching for “auto ac repair“, “ac recharge service“, “car air conditioner repair near me“, “car ac compressor repair“, “car ac repair“, “car a/c service near me” or “truck ac repair” in Scottsdale, Bridwell Automotive Center can help!